Call us at (856) 678-8600 for more information about this bunny! There are more than 60 breeds of rabbits, including the Dutch (very popular in the United States), droopy-eared German lops and furry Cashmeres. Although domestic rabbits make great companions, they are delicate animals and require special care. Rabbits can be frightened when well-meaning children hold, cuddle or carry them. And when scared, rabbits may scratch or bite to protect themselves. So while a rabbit may be a great pet for your family, an adult should be the primary caretaker. 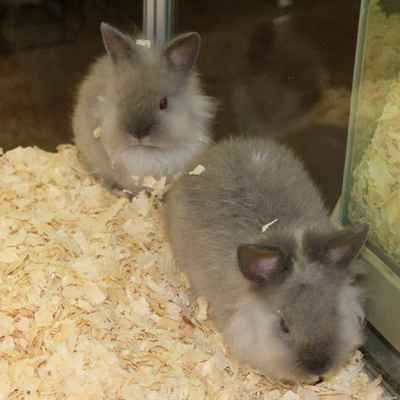 Two female rabbits will usually do well together. As long as one of a male/female pair is spayed or neutered, they should do fine. Unless raised together from babies, two males are likely to fight if housed together. Rabbits love interaction with humans, so it’s best to keep them indoors. Make sure you get a cage that allows your rabbit to move freely – rabbits require lots of room for housing and exercise. Your rabbit will want to exercise several hours a day, so he will need a safe area with ample room to run and jump. Any outdoor area should be fully enclosed by a fence and supervised. Also, it’s important to rabbit-proof an indoor area by covering all electrical wires and anything else your pet might chew. Also, make sure that no other pets can enter the room and that there are no house plants in reach that could be toxic to your rabbit. Put something in your rabbit’s cage for it to chew on, such as unpainted, untreated wood or a cardboard tube, and make sure to provide a constant supply of Timothy Hay. Rabbits’ teeth never stop growing, so they need to chew on things for proper dental health. If you do not provide adequate chew toys, your rabbit may chew on your furniture! Buy a cage with a solid bottom, and put down plenty of bedding. Don’t use cedar shavings or clay cat litters. Aromatic oils in cedar bedding have been shown to have adverse health effects on small pets. Also, unlike dogs and cats, rabbits do not have pads on their feet so splinters from wood shavings can harm their sensitive feet. As soon as your rabbit chooses a corner of the cage to use as a bathroom, put a shallow box or litter pan there filled with bedding. Your rabbit is difficult to litter train; you may want to line the entire bottom of the cage for added absorbency and odor control. Change the litter box daily, and change the cage bedding once or twice a week. Remove soiled bedding, droppings and stale food from the cage daily. Clean the cage completely once a week by scrubbing the bottom of the cage and soiled accessories with warm water and a gentle soap and replacing dirty litter and bedding. Make sure to rinse and dry everything completely before returning it to the cage. A pet rabbit has very specific dietary needs. Make sure you feed him a high-fiber, low-protein diet. Long fiber grass hay is essential to in preventing health problems, such as gastrointestinal stasis (a potentially deadly blockage attributed to, among other things, a diet lacking in fiber) as well as obesity. A specially formulated food for rabbits should provide variety while maintaining the proper fiber/protein balance necessary. To enhance the healthy coat of your pet, a diet with balanced Omega 3 and Omega 6 fatty acids should do the trick. Rabbit food meets the nutritional and dental health requirements. Clean fresh water, dispensed in a bottle, should be available at all times. As we said, rabbits are delicate. Pick up your rabbit by supporting his forequarters with one hand and his hindquarters with the other. Failure to handle him properly could cause spinal injuries. Never pick up a rabbit by his ears. Brush your rabbit regularly with a soft brush to remove excess hair and keep his coat in good condition. Brush from the back of the head down to the tail. You should bring your rabbit to the veterinarian for a new pet exam, as well as every six months for a wellness exam. Ask your veterinarian how to clip your rabbit’s nails to prevent injury and infection. If your rabbit stops eating or moving his bowels or has watery diarrhea, seek care immediately. Other signs of illness include runny nose and eyes, dark red urine, lethargy, fur loss and red, swollen skin.